This necktie is highly recommended. These necktie gifts are a great way to elevate your wardrobe and make the perfect gift -- even if it's for yourself! Perfect for formal, professional, or casual wear. We only use high-quality silk fabrics, created with an elegant surface, to offer both elegant style and pleasing comfort. The on-trend color choices offer a variety of choices for any season or occasion. They are a perfect gift and would be an excellent addition to anyone's wardrobe. Designed with style and sophistication, these elegant neckties offer a perfect balance of classic design and modern styling. It uses the environmental protection material quality. Come and have one! Color: Multiple colors, designs, and textures, as shown. One tie and high-end gift box per purchase. 25 colors available! Select your favorite one above. 1. A variety of fashionable designs in each tie offers an elegant appearance, every day. 2. Comfortable and durable polyester, with a sophisticated finish, yet suitable for daily wear. 3. Delicate and exquisite workmanship to reflect a man's inner confidence, style, and vision. 4. Our special quality control departments ensure the highest standards of craftsmanship. 5. Each tie is crafted with superior construction and materials for style, durability, and longevity. 6. Ties measure approximately 3.54 inches in width, and 59 inches in length. 1) Please allow for slight variations in length, as well as colors, from those shown on different devices and screens. 2) Standard length (about 59 inches); however, this size may not fit all. 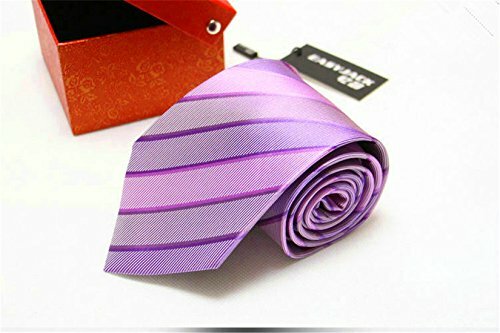 MATERIAL: Made from 100% high-quality silk. Offers a professional and stylish appearance, yet is comfortable, and durable enough, for daily wear. SIZE: Standard length (about 59 inches). Width is stylishly thin (about 3.54 inches). (consider about 1" error). One size fits all. GIFT IDEA: New neckties are perfect for birthdays, holidays, or just because. A great gift idea for fathers, husbands, sons, and men of any age. I will do free shipping on buy it now. WASHING INSTRUCTIONS: Washed by hand / low iron / Do not bleach. OUR GUARANTEE: 100% satisfaction guaranteed. Our mission is for our customers to feel extremely gratified with the ties they purchase, so if you aren't entirely pleased, please take advantage of our swift exchange and return policy. If you have any questions about this product by BAGLAND, contact us by completing and submitting the form below. If you are looking for a specif part number, please include it with your message.